Summary: Natasha: I’m a girl who believes in science and facts. Not fate. Not destiny. Or dreams that will never come true. I’m definitely not the kind of girl who meets a cute boy on a crowded New York City street and falls in love with him. Not when my family is twelve hours away from being deported to Jamaica. Falling in love with him won’t be my story. Going in to this novel i had very high expectations. I read Nicola Yoon’s debut novel Everything Everything in 2016 and absolutely adored it, it quickly made its way on to my favourite novels of 2016 list. So The Sun Is Also A Star was a very anticipated release for me. I chose to go in to this novel without any knowledge. I was aware that it contained some quite diverse characters, and that was all. Natasha is from Jamaica, having moved to the U.S nine years ago, she loves her life in New York city, and the idea of returning to her home country is filling her with dread. Daniel is form a very strict, Korean family, even though he has lived his whole life in American, Korea is a huge part of him. Having two diverse main characters like this was actually extremely refreshing. I have read very few novels (especially YA novels) that haven’t had White British or White American main characters, and to have very few in the story shows the kind of diverse New York that is real. The characters ethnicities were touched upon enough to make it important, without it being overwhelming. As i said, i had extremely high hopes for this novel, and i found myself comparing it to Everything, Everything quite a lot. In reality, these two stories are completely different and cannot be compared. The Sun Is Also A Star takes place over just one day of time, something i wasn’t expecting. It’s quite a lengthy book to only take place over one day, but it is told well and it doesn’t feel as though the characters are cramming everything in to time to fill the story out, it was written wonderfully. In true Nicola Yoon style, the chapters are short and easily digestible. However unlike her other work, this novel changes point of view of characters with each chapter. I found myself in two minds about this. Because the chapters were so short, it ended up being a very easy and fast paced read. However, i found myself confused about who’s point of view i was reading quite often and had to flick back a page to check. Saying that, there are also odd chapters titled ‘eyes’ for example, that give us some science background on a matter that is being discussed by Natasha or Daniel. This was particularly wonderful part to the story as it added so much more than just the teenagers romance. When i was nearing the end of the novel, i felt a little unfulfilled and like the story was lacking in some way. I couldn’t put my finger on it, but it didn’t make me as happy as her pervious read had. However, once i reached the epilogue, i found what i was looking for. I feel as though through this story you are looking for some kind of closure for the characters, some way for them to meet again and i couldn’t see it. The ending truly made up for the rest of the slightly stressful read. 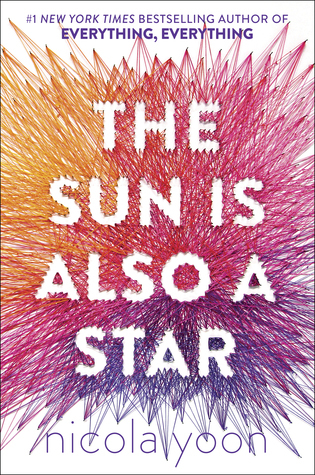 I think more than anything The Sun Is Also A Star has solidified my love for Nicola Yoon. She is without a doubt one of my auto-buy authors now, and i adore the stories she tells with wonderfully different characters. Characters that are different from other teenagers and show a side to young-adulthood that not a lot of novels show. She’s a wonderful author and this is a wonderful love story.